Starstruck is generally considered to be Australia’s first screen musical but director Gillian Armstrong now reveals that two weeks before recording the soundtrack, the filmmakers discovered that they had no songs. All the tracks submitted for selection were, to put it bluntly, crap. Armstrong, fresh from her hit debut with My Brilliant Career, admits in the DVD interview that she was perhaps a little naïve about the intricacies of making a musical but luckily, she was introduced to Phil Judd from the local New Wave pop band ‘The Swingers’ who had just had a hit with the single ‘Counting the Beat’. Five days later he handed her the song that was to become the film’s theme and followed it up with a string of others, all of which made it into the final cut. Tim Finn also contributed what is perhaps the most outstanding track, ‘Body and Soul’, and so filming began on this delightful romp. Based on the childhood memories of writer Stephen MacLean, the plot is a tribute to the old Judy Garland and Mickey Rooney films in which a couple of wide-eyed hopefuls get their act together and, against all odds, put on a show that eventually saves the day. It’s Sydney circa 1980 and Jackie Mullens (Jo Kennedy) is an effervescent singer working as a barmaid in her mother Pearl’s pub, located directly underneath the Harbour Bridge. Jackie’s blood pumps with showbiz, injected with enthusiasm by her 14 year old cousin Angus who, as her self appointed manager, mounts all manner of crazy stunts to get her noticed. But when the brewery threatens to take away the pub, the kids have to crack the big time pronto and win the cash prize that goes with it. This is high voltage Australiana fuelled by vibrant sets designed by Brian Thompson of The Rocky Horror Picture Show fame, and wonderfully imaginative costumes by Luciana Arrighi and Terry Ryan. And to top it all off, there’s the glossy cinematography by Russell Boyd (Oscar winner for Master and Commander) and a cameo by Geoffrey Rush as a television floor manager. 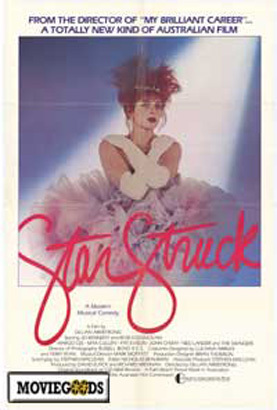 Nearly twenty five years down the track, Starstruck still stands as one of the freshest Aussie musicals ever produced on film, a benchmark that paved the way for the likes of Strictly Ballroom and Pricilla, Queen of the Desert.